I thought about writing a review of this, but I don’t really have enough to say. Besides, I mention it in the review of Quiet Rumours (they even have collaborators in common). So have a cat instead. Any comments on it are welcome though! Turns out people apparently find this blog searching for this book, so I feel like I need to say a bit more about it. First of all, its goal is laudable, to bring together queer politics and anarchism. The anarchist discourse on issues on LGBT issues nowadays is often influenced by liberal identity politics, usually because anarchists don’t realise there are more options than liberalism or conservatism. This intellectual laziness is not excusable, especially with such books available. 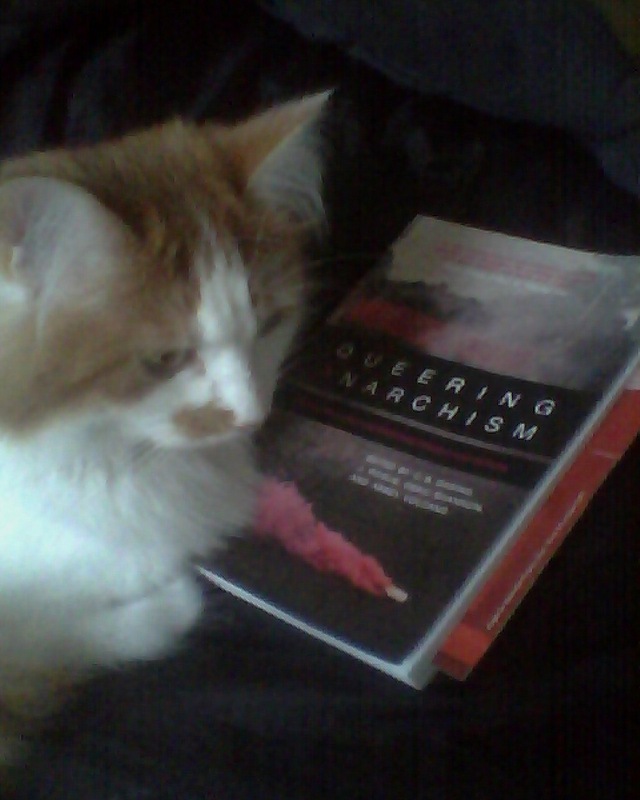 Queering anarchism is not an academic book, it is easily accessible, and at the same time, it does not appear to dumb down issues. In that sense it follows the best tradition of anarchist writers (on them, the quote by Bakunin about destruction and creation appears countless times, and the other references are Emma Goldman… a little variety could have been good). The only thing that I would say this book is missing is perhaps a few contradictions. Most of these texts (especially in the first half of the book) are so similar that it left me thinking that organizing them into a book rather than a collection of essays would have made more sense (having shorter, independent texts to distribute is good, but that’s what the internet is for). Also there needs to be a disclaimer that this Queering Anarchism is very much about the English-speaking world (our very own Autonomous Centre of Edinburgh gets a mention! ), with no text translated from any other language. In this sense, it does demand to be expanded! Personally, the text I had most difficulties with was Harm Reduction as Pleasure Activism, because its mention of Dionysus cults is too vague to be of any use, and it fails to give any space to anti-alcohol anarchist campaigns (especially in Spain at the start of the 20th century), which would have been interesting to contrast. It is interesting to point out how anarchism and harm reduction converge, but it would also have been interesting to see how they historically diverged. Some people are bound to ask ‘But, what about the class struggle?’ Well, one article is all about its importance, which will rejoice or reassure them: the queers will not take your proletariat away.